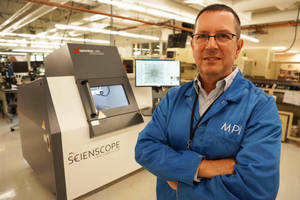 Chino, CA - Scienscope International, a complete inspection solutions provider, is pleased to announce that Microboard Processing Inc. (MPI) has purchased a Scienscope X-Scope 6000 X-ray system. MPI, a 33-year old, woman-owned EMS provider, installed the unit at its Seymour, CT facility. The electronics manufacturing industry's most demanding customers trust MPI to manufacture their mission-critical electronic assemblies for electronic warfare, avionics, high-speed network products and life-saving medical equipment. For more information about MPI, call (203) 881-4300 or visit www.microboard.com. The X-Scope 6000 is a digital, fully programmable CNC controlled X-ray inspection system that allows operators to program inspection and measurement routines with point-and-click ease. It features a high power 130kV 5 micro closed X-ray tube, 70° camera tilt for oblique extreme angle inspection and 1,000X system magnification. Scienscope also offers various 100 percent automated inline platforms such as the X-Scope 8000 to meet the needs of many different industries. Todd O’Neil: Business Development Mgr.